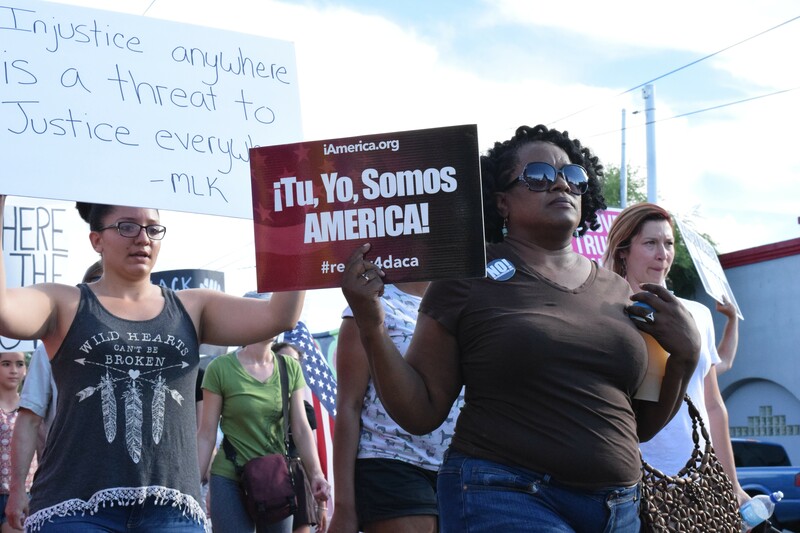 More than 2,000 Tucsonans marched downtown in solidarity with Charlottesville, Virginia, and in opposition to violence and racism. The repulsive spectacle of modern-day Nazis marching in Charlottesville over the weekend, culminating with one of the wretched white supremacists killing one anti-hate protestor and injuring 19 more by driving his car into the crowd, turned the stomach of most Americans. Still, as the old saying goes, it's better to remain silent and be thought a fool than to open your mouth and remove all doubt—which brings us to Pima County Supervisor Ally Miller. Miller, a Republican in her second term representing the Catalina Foothills, Oro Valley and Marana, focused on her own victimhood in the wake of the deplorable incident in Charlottesville. For some reason, Miller saw widespread condemnation of white supremacy as an attack on herself, so she took to Facebook to announce: "I'm sick and tired of being hit for being white... It is all about making us feel like we need to apologize. I am WHITE—and proud of it! No apologies necessary." We've had plenty of criticism for Ally Miller over the years. She's paranoid. She's a pathological liar. She's hiding public records from the public. She's a tyrannical and unstable boss who has driven a long list of staffers from her office. She's lousy at constituent service. She undermines economic development efforts and the business community. She's a generally unpleasant and unbalanced human being whose bizarre political escapades have been well chronicled in our pages. In short, she's Pima County's mini-Trump. But not once has it crossed our minds to "hit" Miller for being white. Heck, we didn't even make fun of her bad dance moves when she was celebrating the defeat of Pima County's 2015 bond package. And we haven't seen any of her long list of critics do that, either. Pima County Supervisor Richard Elias (D-District 5) called on Miller to apologize for her comments, which is like calling on a scorpion to not sting the frog that's carrying it across the river. "Instead of calling for unity after the death of three Americans, as Neo-Nazis and domestic terrorists marched on the streets of an American city, Supervisor Miller called for further division," Elias said in a prepared statement. "Supervisor Miller, no one is asking you to apologize for 'being white,' but you owe it to our community to apologize for your remarks." Supervisor Sharon Bronson (D-District 3) told The Skinny that "what happened in Charlottesville was sickening. And clearly (Miller's) remarks, taken contextually, come very close to being complicit in white supremacy." Miller's fellow Republican on the Board of Supervisors, Steve Christy of District 4, condemned Nazis in a statement to the press. "The violence and resulting deaths in Charlottesville, Virginia this past weekend are deplorable and shocking," Christy said in a prepared statement. "Anything resembling activity involving or utilizing the putrid smell of 'White Supremacy,' 'Neo-Nazism,' and the 'KKK' should and must be condemned in the strongest of possible terms. There is no place in our American society for any kind of violent and racist behavior." Then Christy came to the defense of Miller, saying that her "post using her personal Facebook account to comment on a shared article unfortunately gave her detractors the fodder they have been waiting for—an opportunity to pounce and to denounce her." Yes, Steve, that's right: People are denouncing Ally Miller because, for reasons unknown, she saw criticism of a racist march as a personal attack on herself. Why are you standing up for this hot mess? And where is she keeping your gonads? Anyway: We know how much Miller loves the call-to-the-audience segment of the Board of Supes meeting, so if you'd like to let her know what you think about her comments, why not attend the next one? It's at 9 a.m. Monday, Aug. 21, and we're sure she'd love to hear from the public on this one. The televised edition of Zona Politics with Jim Nintzel airs 6:30 p.m. Fridays on the Creative Tucson network, Cox Channel 20 and Comcast Channel 74. The TV show repeats Sunday mornings at 9 a.m. The radio edition of Zona Politics airs at 5 p.m. Sundays on community radio KXCI, 91.3 FM.